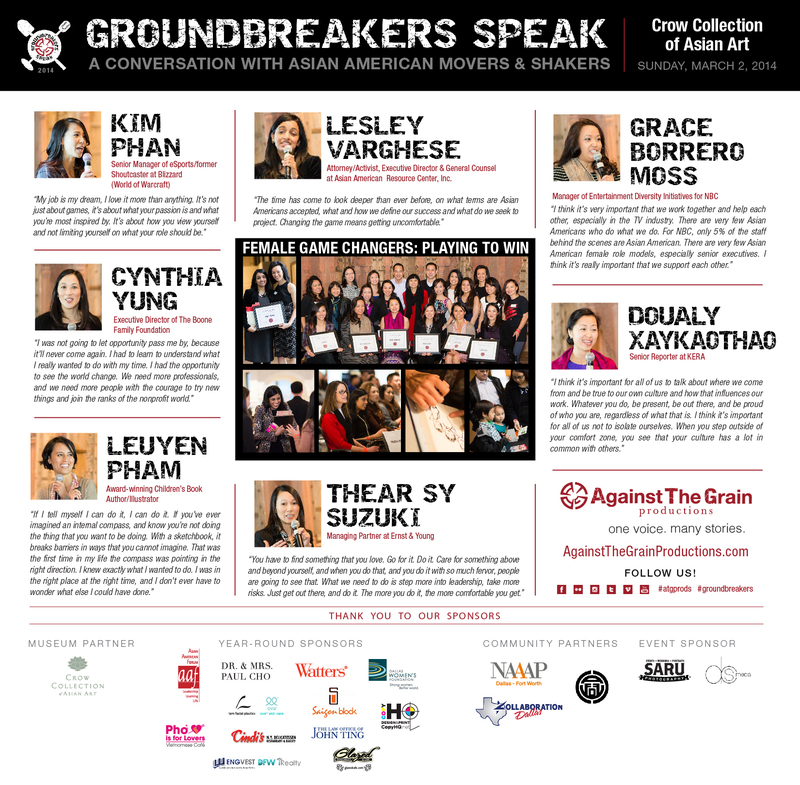 DALLAS, TX – Seven game-changing female Asian American leaders gathered to share personal stories about their paths to success at Against The Grain Productions’ 3rd Annual Groundbreakers Speak event on Saturday March 2, 2014, hosted at The Crow Collection of Asian Art. Despite the blustery weather conditions, guests packed into the museum’s main gallery to enjoy hors d’oeuvres, wine, coffee and art before settling in to listen to each speaker’s TED-inspired personal presentation around this year’s theme: “Game Changers: Playing to Win.” After sharing their diverse perspectives, speakers joined together as a panel to answer questions and cover hard-hitting issues about identity, cultural barriers, motivation and solutions to nurture leadership in the community. Imparting their insight, there were moments both humorous and poignant. The event concluded with a unique half hour where guests got to interact with speakers one-on-one. Video clips of each speaker will be available on ATG’s YouTube Page. Read the Asia World Media Coverage. 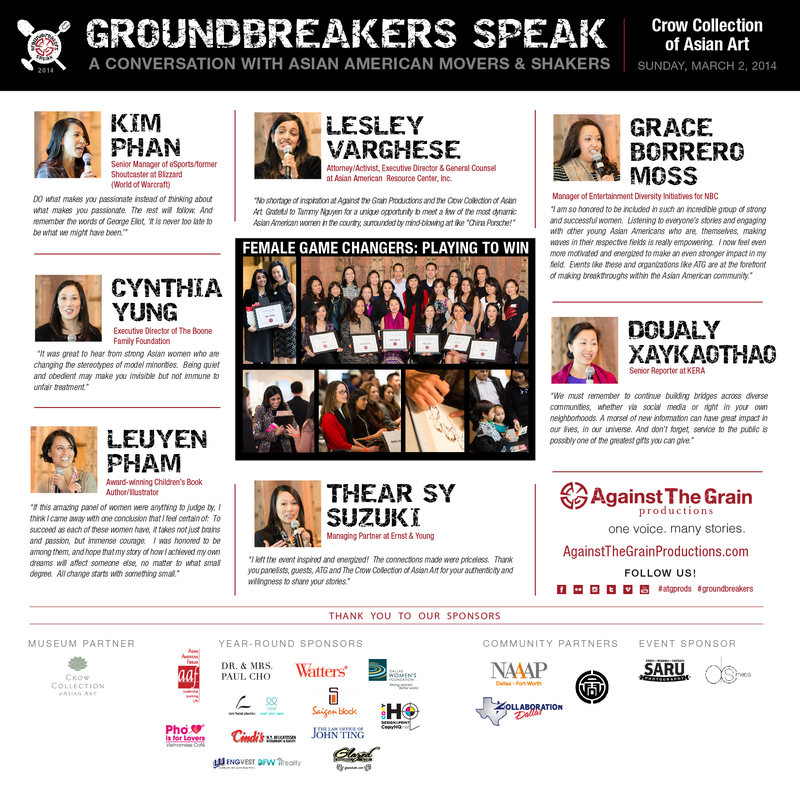 ATG Against The Grain Productions, a Dallas-based 501(c)(3) nonprofit organization, promotes Asian American cultural awareness through compelling media projects and raises funds for international orphanages. In addition to hosting outreach events, it also awards an annual scholarship to exemplary Asian American student artists and leaders. ATG produced the feature documentary, Operation Babylift: The Lost Children of Vietnam, which has screened at over a dozen film festivals nationwide and received the Audience Choice Award for Best Feature Film at the Vietnamese International Film Festival and the Documentary Audience Choice Award from the Philadelphia Asian American Film Festival. For more information, visit www.AgainstTheGrainProductions.com or www.TheBabylift.com.